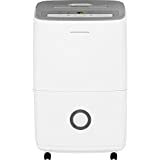 Frigidaire - FFAD3033R1 : Dehumidifier Review • The Air Geeks, reviews of air conditioners, dehumidifiers and air purifiers. Excess moisture can make your house dumpy and musty. It can also damage your household possessions. You can avoid this by getting a powerful humidity control unit for your house. You should not allow the weather to dictate the conditions of your room. The FFAD3033R1 is designed to transform the environment of your room and make it unfavorable for mold and mildew. This dehumidifier is designed for small and relatively medium rooms. Its capacity allows it to pull moisture from the air at a rate of 30 pints in 24 hours. In case you are planning to get a humidity control system for your small room, garage, music room or walk-in closet, then you should consider this unit… it is specially engineered to suit your needs. Excess moisture can affect the environment of your room if there is no means of controlling it : it damages furniture and other valuables and leaves your room with a dumpy and musty smell. In addition, it creates a favorable environment for bacteria and other microorganisms that can cause harm to you and your family. You should get a means of regulating the relative humidity of your room as soon as you notice that the levels are unfavorable. This dehumidifier is optimized to maintain the relative humidity of your room within your preferred level. You should consider the size of your room before selecting a dehumidifier. Some models may be suitable for your house whereas other may not. For a large room, you should go for a high capacity unit and vice versa. The FFAD3033R1 is designed with a capability to draw up to 30 pints of moisture in 24 hours. This unit is suitable for relatively small rooms, or niche uses : boats, cars, garages, walk-in closets, etc. A cable that is easy to fold! It effectively pulls the moisture from the air to make your room a comfortable place that is free from mold and mildew. It also helps you to breathe without difficulties. 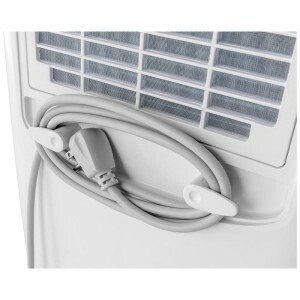 Virtually all dehumidifiers come with a reservoir for storing the collected water. This unit features a 7.6-pint tank that is located on its front side. This tank is ergonomically designed to allow the user to dispose the collected water with convenience. In addition, this system is designed to alert you when the tank is full. In case you are not available to empty the tank when it is full, the system shuts off automatically to avoid water spillage on the floor. You therefore don’t need to worry that the unit will flood your house when you are not there. For high humidity places, the unit can pull a lot of water from the air within a short time. This means that the user is expected to empty the reservoir after a couple of hours. For some people, this can be a tedious exercise. It is therefore important to position the unit close to a suitable drain for easy and convenient disposal of collected water. If you are not available for this task, the unit offers you a more flexible option. The continuous drain option allows you to use a standard garden hose to drain the collected water. The FFAD3033R1 is an Energy Star rated appliance that is designed to consume minimum energy. This high efficiency unit is also engineered to operate without producing excess heat. In addition, it offers ready-select electronic controls to enable you to regulate the relative humidity of your room with ease. Furthermore, the FFAD3033R1 offers a control lock and a 24-hour on/off timer. In case you are looking for a portable unit, then the FFAD3033R1 is an ideal choice for you. This unit features caster wheels to allow you to move it from one room to another with ease. 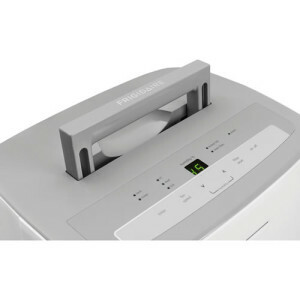 In addition, it features a top handle and integrated side handles for easy holding when moving it. Highly effective. Most users have observed that this unit brings the relative humidity down within a short period of time. The unit fills the reservoir within hours when it is employed in a high humidity place. Intuitive and easy to use. The unit offers easy-to-use controls. It is also easy to remove and return the reservoir. Most users are satisfied with how this unit is designed. Warms the room. Some users have noted that this unit warms the room. This can cause the temperature to go up by a few degrees. Small reservoir. This unit fills the reservoir within hours : the tank is small, even for smaller room uses! I've only had this for a few days, but so far I love it! It was already all put together in the box. I opened the (well-packaged) box and took out the dehumidifier. I read the instructions thoroughly. I took all of the protective tape off from around the product, plugged it in and turned it on. (I popped out the wheels from the bottom since I have the unit up high on a credenza where the warm, moist air rises. I put the wheels in the plastic bag along with the instructions and the garden hose converter in case I need them later.) I had been using the largest Eva-dry dehumidifier in my bedroom for over a year. It took about a week to remove about 4 pints of water. It couldn't keep up. I wanted a bigger dehumidifier but not a huge one. So, I got this 30-pint Frigidaire. After about an hour and a half, the humidity in the room (as measured by my hygrometer) dropped about 11%. Wow! The temperature rose about 2 degrees in the room in that time. (I measured the air coming out of the dehumidifier with my thermometer/hygrometer. The temperature in the room was 82 degrees. The temperature of the air coming out of the dehumidifier was 97 degrees (F) and still rising. The humidity in the room was about 52%. The humidity of the air coming out was 31% and still falling. My arm got tired from holding the thermometer/hygrometer. In the future, I may do another, longer test for more accuracy.) It's important to note that the instruction manual states to NOT use this in a closet. It will overheat! It also states that you need at least 12 inches of clear space all around the unit." This thing lowers the humidity by about 20% in our large master bedroom/bathroom. Our towels were smelly and we had some mold on the bathroom window sills, but we don't anymore. The tank fills up in about 8 hours on the high setting. This is not for an entire house. We had a water leak and the cleanup crew had 3 dehumidifiers easily 10x as big. It's good for a room, but it does heat it up about 10 degrees. Overall we sleep better and are happy. Edit: This thing keeps humidity around 45-50% in our bedroom while running 8 hours per day (it takes that long to fill up 30 pints). It also uses about 315W, so about 5 of the old incandescent light bulbs. So roughly every 3 hours it uses 1 KWH, at 10 cents per kwh, and 240 hours per month (8 per day), it will cost ~ $24.00 per month to run. But this is only really needed in the summer, as a heater dries out the house pretty well." The Frigidaire FFAD3033R1 is a compact dehumidifier that is ideal for relatively small rooms, or closets. This 30-pint unit effectively pulls moisture from the air to give your room a comfortable environment. It is engineered to make your room an unfavorable place for mold, mildew, and bacteria. Most users are impressed by the performance of this unit, however the small tank is a concern. After considering the strengths and drawbacks of this unit, we think it deserves a 3.5/5 rating.